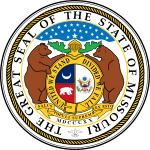 Nixon carried Missouri with 62.29% of the vote to McGovern’s 37.71%, a victory margin of 24.58%. As of the 2016 presidential election[update], this is the last election in which Jackson County voted for the Republican candidate. ^ David Leip. "Dave Leip's Atlas of U.S. Presidential Elections". Uselectionatlas.org. Retrieved 2017-04-09. This page was last edited on 1 April 2019, at 03:19 (UTC).